When was the last time a UK player shot TWENTY free throws in one game ? PJ Washington got the Yante Maten treatment tonight..but only after it was apparent that he was a mess at the free throw line. Everybody in the building knew he was going to keep missing free throws. It was written all over him. And the refs knew it. PJ has been getting beat up and put to the ground and such all season..he never came close to shooting 20..TWENTY free throws in a single game. I said in a thread earlier tonight that there was a play that I could have swore that SGA drew the foul on and should have been shooting free throws..it comes back from commercial/the TV timeout and PJ is back on the line shooting for that foul. When he was like 4/10 is when it started. He turned a couple of them into and 1s..I don’t think the refs anticipated for those to happen. He also was the one shooting on the majority of our 1 and 1s. Very odd and strange and fishy that one guy shot over half of UK’s free throws..oh and he just so happened to be struggling badly from the line that same night. Hmmm..very odd indeed. Say what you want, but it was fishy as all hell. So obvious how the refs engineered a loss by giving the losing team a plus-15 edge in free throw attempts and fouling out three separate players on the winning team, including their top scorer. DO I GOTTA SPELL IT OUT FOR YOU OR WHAT. It’s worth noting, here, that P.J. Washington, who made just eight of 20 attempts from the line Thursday night, was a 61 percent free throw shooter headed into the tournament—no great shakes, but had he made 11 of those 20 freebies, Kentucky would’ve forced overtime, and he still would’ve been below his season average from the line. If he’d made 12—still below his season average—the Wildcats win. This theory requires that game officials conspired to undermine the Wildcats with a plan that required the very worst free throw shooting performance of Washington’s career. Worth noting, also: it’s not just poor, addled Steve fighting atop this ridiculous hilltop. Acolytes! 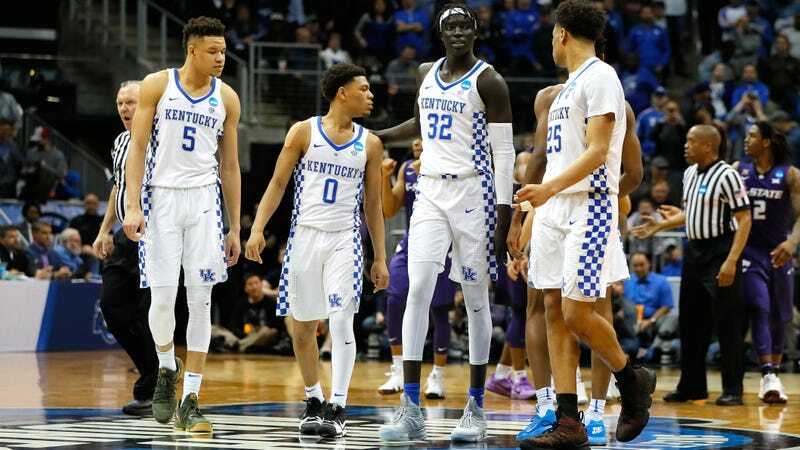 Thankfully, our boy Steve has irrefutable evidence to support his theory: that it has been a long time since one Kentucky player shot 20 free throws in a tournament game. Owned! Sports fans are the absolute best, and the absolute worst. God bless you all.